I didn't get the memo about the lore & legend behind this incredible 1950s-60s label, nor that DUST-TO-DIGITAL had put this quintuple-CD box set out late last year, until it was highlighted by Byron Coley in one of his ARTHUR columns. 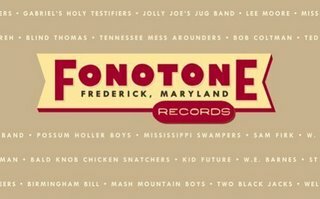 FONOTONE was the nation’s last 78rpm label, and was run pretty much out of a basement by legendary record collector JOE BUSSARD, whom we last discussed in this forum when reviewing 2004's "Down In The Basement" collection. The way it worked was that Bussard would record local and itinerant old time country/bluegrass/blues musicians whom he admired, or who happened to buzz by his place by chance -- seriously, there are numbers on here in which the liner notes reveal that the players just rang the doorbell -- and later that night or that weekend they had a 78rpm record cut in Bussard's basement, which he then sold by mail (and according to the 160-page book that comes with this, they sold quite well). Bussard was not only the most well-known record dork/crank of his time, he had a cool radio show that kept these pre-WWII sounds alive throughout the "northern South". So he gathered up a like-minded posse of local spirit-keepers from 1956 to 1970 and kept the 78rpm flame burning just a few years longer than it otherwise would have - and in the process, laid down some raw, beautiful tunes - including multiple early recordings from Blind Joe Death himself, JOHN FAHEY. The collection here is a whopping 131 songs on 5 CDs that does not even come close to documenting all the 78s that Bussard pressed up. Surprisingly, a great deal of the recordings, roughly a quarter, feature Bussard himself playing a variety of string instruments. He and his inner circle of equally obsessed friends recorded under a variety of relevant monikers like JOLLY JOE'S JUG BAND, TENNESSEE MESS AROUNDERS and the BALD KNOB CHICKEN SCRATCHERS, and laid down work that in many cases was as enthusiastic and joyful as the original mountain giants they were worshipping. It was a life with these guys, and that included not only collection but note-pure emulation. Since these recordings and performers are a generation removed from their original pre-WWII heroes, you’ll probably find them "cleaner" than the pre-war stuff, but the instrumentation and the cackling country ethos is identical, and some of the playing is just as mesmerizing. Imagine another excellent box set – “ROOTS AND BLUES” from over a decade ago – and imagine that their progeny kept the faith for 30 long years and then set out to recreate it, note for note, including originals in the old time style. Some of the originals are totally goofus compositions about current events, like JFK’s assassination or the moon landing. Besides his buddies & himself, Bussard recorded all the like-minded talent he could get his hands on, and lots of it is knockout, particularly the breakdown fiddlers on the first 2 discs whose names escape me now (suffice to say, mastering everyone’s names over 5 CDs requires a bit more research. I’ll get there). The true draw for most folks will be the legendary set of 78s a very young JOHN FAHEY recorded with Bussard. His complete set of Fonotone recordings is not captured here – for those, we’ll need to wait for a rumored Revenant collection – but there are enough guitar wonders here to keep your whistle wet. Several of these showed up on the first couple of proper LPs, “The Legend of Blind Joe Death” and “Death Chants, Breakdowns and Military Waltzes”, and are in keeping with the bluesy spirit of his nascent career. The mindblowing "Weissman Blues" sounds like Fahey's playing it with 12 fingers, and blind polling of just about anyone would have them guessing at at least 2 or 3 guitarists in the room. There are still other recordings by the “MISSISSIPPI SWAMPERS” where there are two guitarists present – Fahey and “Backwards Sam Firk”. All are essential, except for perhaps the one where Fahey sings (!). In total, this cigar-box-encased Fonotone set is a beautiful thing (bottle opener included! ), and it can be had online for as little as 50 bucks. To steal a quote from Coley's review of this in The Wire, "it's weird to think that some of this stuff was still being played this way in the latter part of the 1960s, but I suppose that just emphasizes the increasing velocity with which culture has changed in the meantime". Well put, and precisely why this terrific set feels genuinely authentic, and not like a county-fair or street-festival snapshot of a modern olde-timey band from today.